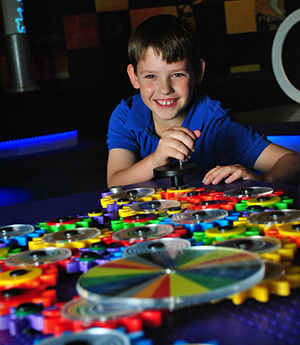 Test your power at Cobb+Co Museum's Energy for Life Discovery Centre. How much people power does it take to run a mobile phone? How about a hair dryer, or to boil a kettle? How fast can you make a marble travel through your maze using only the energy from gravity? How can you make it travel faster. You will be amazed at the different types of energy you have within you. See the energy in a clap, in the heat from your hands, the power in your jump. Gears can make us more energy efficient – can you make the music play faster and slower just by using the gears. Some of the themes explored in the new Discovery Centre include What is energy?, Where does it come from?, How does it behave?, How does it affect us?, How does our body use and store energy? and How can we use energy more sustainably?. The Energy for Life Discovery Centre explores these significant issues in a way that is fun and challenging and makes you think about how you use energy in your own life. To register your interest or for further information call us on +61 (0) 7 4659 4900 or contact us using our online form.